Bernie Sanders speaks in Washington Square Park in New York City. Some of Bernie Sanders’s biggest supporters may not be able to vote for him in New York’s primary on Tuesday. Unaffiliated voters are a big share of Sanders’s support, but New York makes it hard for voters to register for a party at the last minute. For example, Erica Garner, daughter of Eric Garner and a Sanders supporter, can’t vote in the Democratic primary because she didn’t change her party registration in time to qualify. It’s an issue for Republicans too: Some high-profile Donald Trump supporters — or at least two of his kids — won’t be able to partake in the fun. Twelve states and the District of Columbia have earlier deadlines to switch parties than to register for the first time,2 but only two of them, Kentucky and New Hampshire, had cutoffs to change parties (for those already registered with one) more than 100 days before their primary or caucus.3 I looked only at states without open primaries or caucuses.4 In open primaries, any voter can weigh in on the presidential candidate nomination process for either party. Some states, such as Wyoming and Maine, allow new voters to register and pick a party up to the day of the election but require people who have previously voted to change parties about two weeks before the election. That kind of cutoff may be confusing to residents who assume that same-day registration means you can also make same-day registration changes. However, it is still a more modest deadline than many states set for both new voter registration and updates. Activists have tried to loosen New York’s rules, but with few successes. The Voter Empowerment Act, the most recent attempt, is still stalled in committee in the state Senate. Blair Horner, the legislative director at New York Public Interest Research Group, a liberal nonprofit, says that Albany legislators write rules to make it easier to get re-elected. “New York’s elected officials like to know who the voters are who are showing up in an election,” he said — voters who are new to a party may vote too unpredictably for incumbents’ tastes. New York had one of the lowest turnout rates in the country in 2014, which could help incumbents who have to reach only a small pool of voters. Sarah Audelo, the political and field director for Rock the Vote, a nonprofit voter registration organization, told me these unexpected extra deadlines like New York’s stymie voters and advocacy groups. Although Rock the Vote does year-round registration drives and is more likely to catch voters in time to satisfy these rules, she said, “smaller-based, issue-based organizations have it really hard with these requirements, especially youth-led organizations.” Neither the New York state Republican Party nor Democratic Party replied to my requests for comment on its primary rules. Check out our live coverage of the New York primary elections. When states phrased their cutoff as “one month before the election” rather than specifying a number of days, I treated all months as though they had 30 days. When states specified something like “the 10th Friday prior to the election,” I computed that number for this year. Since I was most interested in the states that had different rules for changing party registration than registering to vote, I excluded states that set the same deadline from the chart. Because I consulted state board of election websites, voters’ guides and state party websites to assemble this list, it is possible that I missed a state that has a requirement but does not list it on its election calendars or registration guides. And in some cases, the rules varied by party. 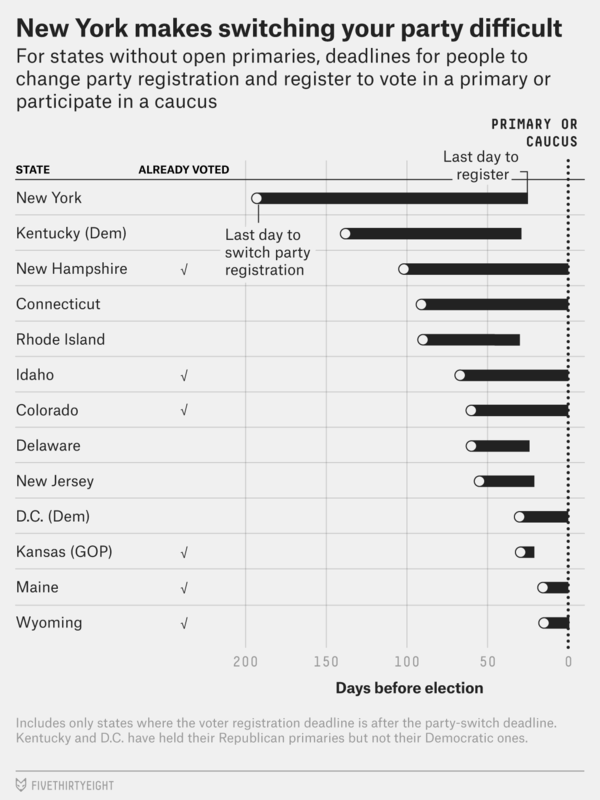 Primaries and caucuses can have any of a range of restrictions. Some allow only registered party members to vote. Others allow unaffiliated voters to pick a primary to participate in at the polling place. Still others allow voters affiliated with some but not all third parties to participate in one of the two major parties’ primaries. I researched the party-switching deadlines for any primary or caucus with an affiliation-based restriction.